The SARD-SC Project Management unit held the 2016 annual retreat recently in Abuja, with staff of all the implementing centers―ICARDA, AfricaRice, IITA, and IFPRI―in attendance. The retreat assessed what was done in the previous year and planned ahead for the new year. Project Coordinator Chrys Akem said the meeting was a critical one because the project is at its winding down phase. Discussions at the meeting focused on project issues while solutions were sought to seemingly knotty issues. Chris Akem flanked by Commodity Specialists Sidi Sanyang and Solomon Assefa. The tone of the meeting was set with the review and adoption of the minutes of the last retreat held October, in Abidjan, Cote D’Ivoire in 2015. Thereafter, Akem conducted a reviewed status of action points from the Abidjan retreat and checked for implementation by the house. The status of the implementation of the Mid-Term Review recommendations were critically examined point by point especially relating to outscaling/disseminating technologies and youth engagement by all the commodity grouos: wheat, cassava, maize, and rice. Several presentations were made by all representatives of the participating centers. 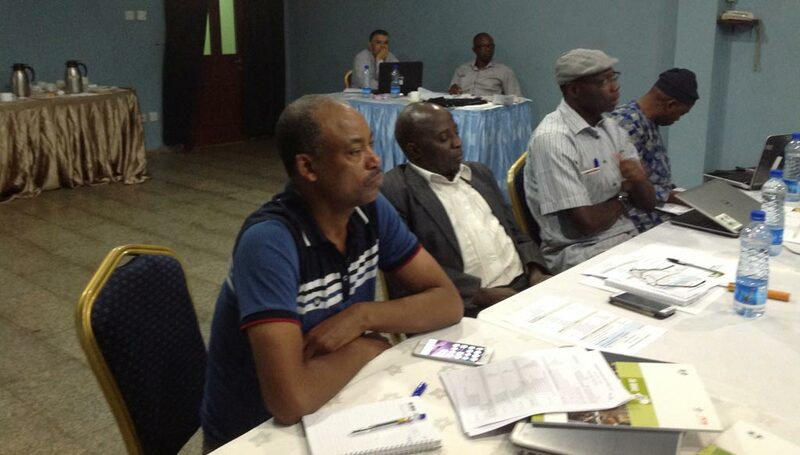 Reports from the Monitoring and Evaluation and Socioeconomic meeting were presented by Issaka Amadou and Paul Dontsop on cassava and maize value chain impact plans. Somado Attiogbevi Kafu and Yameogo Ouambi, both M & E Specialists for rice and wheat commodities, respectively, presented their impact plans, while Tanguy Bernard presented IFPRI’s plans on farmers’ groups and impact. Steve Kiingi, Project Agricultural Business Specialist, gave an update on market linkages. Zulfawu Yahaya, Procurement Specialist, presented on the status of commodity procurement plans for cassava and maize commodities while those of rice and wheat were presented by Abdou Mohammed and Anis Boukadida, respectively. Seyi Fashokun, Project Accountant, gave financial updates on commodity budgets for cassava and maize value chains while Cheikh Abdella and Wahid Zakhama gave presentations on rice and wheat, respectively. focus areas by the Commodity Specialists and other members of the team. To foster intrainstitutional collaboration, networking and team building, group discussions were held on various topics across implementing centers of the project. Among the attendees were the four Commodity Specialists: Sam Ajala (maize), Marie Yomeni (cassava), Solomon Assefa (wheat), and Sidi Sanyang (rice).